The Royal Society is holding a two-day meeting to discuss the Working Group I report of the IPCC. Reader Katabasis was there and send this report. So the first day of the meeting at the Royal Society to discuss the IPCC AR5 report was quite an eye-opener . The tone was set from the start with the first two speakers wringing their hands over the issue of "communicating the message", pointing out that sceptics were apparently "very good" at it. According to Mark Walport, chief scientific adviser to the Government, we sceptics (sorry, those who "deny the science") are "single issue, great communicators." Thomas Stocker followed in the second talk emphasising the "Key 19 messages" in the SPM report. Bob Ward of the Grantham Institute, in the audience, stood and made some handwaving point that included "knowing that there were sceptics here who managed to get a ticket". He cast his arm around to take in the whole audience as he said this and I wondered if he thought we were like hidden bodysnatchers amongst the innocent attendees that everyone needed to be wary of. I made lots of notes during the day; however, in the interests of brevity I'll just mention a few highlights and then go into more detail regarding the final talk that really demonstrated the shocking discrepancy between the IPCC's actual position and the media's hysterical portrayal of it. The day was, as expected, extremely model heavy. When actual observations were superimposed upon model projections they were often embarrassingly small relative to the "data" supposedly being presented. Model outputs were continually referred to as "data", including outputs that refer to something in the future. Several speakers referred to claims that global warming has stopped. They said this claim was untrue and that in fact warming was continuing, it had just slowed down. This is despite the fact that in section B.1 of the SPM, it says: "the rate of warming over the past 15 years (1998–2012; 0.05 [–0.05 to +0.15] °C per decade)"
There was a palpable air of many having been rattled by "the hiatus". Excuses ranged from aerosols to soot to natural variability. One of the latter invocations caused an intervention from the Met Office's Julia Slingo - she pointed out that the PDO could lead to no further warming for up to 30 years, "so we're not out of the woods yet". I thought that was a particularly curious turn of phrase given how so many dedicated alarmists tell me they would be overjoyed if no global warming came to pass. AR5 has apparently introduced very specific definitions for the above. "Abrupt climate change is defined in AR5 as a large-scale change in the climate system that takes place over a few decades or less, persists (or is anticipated to persist) for at least a few decades, and causes substantial disruptions in human and natural systems." A change is said to be irreversible if the recovery timescale from this state due to natural processes is significantly longer than the time it takes for the system to reach this perturbed state. Abrupt changes that aren't really abrupt and irreversible changes that aren't really - er - irreversible. Catastrophe? Er - we don't know. Matt Collins began his talk disarmingly by saying that it could well have been very short - he could have just got up on stage and said "we don't know". I'm glad he didn't because otherwise I would not have been made aware of Table 12.4 in the draft report. It lists all of the catastrophic scenarios that many of us have become used to hearing wailed over by the media and associated directly with the notion of "strong positive feedbacks". Collins showed us the table and went through the details of two of the entries as examples of just how uncertain this area was (click image for full size). What? Yes that's right. The real story may not be in the IPCC rowback on temperature ranges, or its cack-handed "explanations" for the stalling temperatures. It may in fact all be in this table. Be sure to look for yourself. Every single catastrophic scenario bar one has a rating of "Very unlikely" or "Exceptionally unlikely" and/or has "low confidence". The only disaster scenario that the IPCC consider at all likely in the possible lifetimes of many of us alive now is "Disappearance of Arctic summer sea ice", which itself has a 'likely' rating and liable to occur by mid century with medium confidence. As the litany of climate disasters go, that's it. "What the IPCC says, and what the media says it says are poles apart. Your talk is a perfect example of this. Low liklihood and low confidence for almost every nightmare scenario. Yet this isn't reflected at all in the media. Many people here have expressed concern at the influence of climate sceptics. Wouldn't climate scientists' time be better spent reining in those in the media producing irresponsible, hysterical, screaming headlines?" Many thanks Katabasis. Hope you're there tomorrow, when John Ashton is winding up proceedings with a talk on “Reality and its enemies: climate change and its implications for the contract between science and society”. Wonderful post. It is all of our responsibility to get the climb down in this obscure table spread far and wide. To my now admitted regret, focus on the mendacity of AR5 SPM figure 1-4 resulted in the classic mistake of overlooking a bigger and more useful picture. Many thanks for the regrounding. Will shortly become another essay for the next book on climate and energy policies. BTW, did anyone there ask, or explain, specifically what the manifestations are of a disaster of no floating sea ice in late September? Polar bears are increasing after we stopped shooting so many, and I can't remember the last time I read of a human hardship due to lack of sufficient sea-ice. I mean, a "plague of locusts" may eat all the crops, and a "plague of frogs" doubtless has some grave implications. But a biblical "plague of no sea-ice in late September" doesn't really do it for me. Brilliant, Katabasis. Thanks for the great report. "Let's say that science, some decades from now, said 'we were wrong, it was not about climate', would it not in any case have been good to do many of things you have to do in order to combat climate change?." Is that Matthew Collins: Government employee? Joint Met Office Chair in Climate Change? Is he saying that it is not his responsibility to correct widely held misconceptions about the likelihood of imminent abrupt and irreversible climate change as the result of carbon dioxide? Even if this is being incorrectly reported by mainstream media in the UK or touted by senior government ministers as a reason for continuing to meet our international obligations i.e. by raising the price of energy? So if he was asked a direct question about this, say on Newsnight, he would try to bypass his responsibility? No wonder the BBC finds it hard to identify sceptical scientists if even those in full possession of the facts are too cowered to stand up for the truth. Truly insightful and useful summary Katabasis, thank you. So, you discovered even the IPCC admit all bar one of those fabled 'climate catastrophes' are arranged across the unlikely spectrum. We shall seek confirmation from double-agent Nutticelli in tomorrows Guardian. Slingo is just echoing the party line with her: "so we're not out of the woods yet". we have less to worry about. It is not even necessary to read between the lines. The SPM as interpreted by the media, is entirely different kettle of fish. You make a great spy but if you're back there for the second half, you may need to wear a disguise. If most of those climate events were written in a different way, as if it was a sceptic's viewpoint and tone of voice, I wonder how angry warmists would get if we posted them? How many angry comments would it engender if it appeared in the Mail? Somebody could tweet them to Lord Deben one by one and then wait for him say things about how unhinged deniers are. It seems that our new Chief Scientific Advisor's main contribution to the scientific debate is his ongoing concern that the message that we are all going to fry and the fact that the science is sound is not getting through to the deniers. I look forward to his resignation when the day of enlightenment arrives. Hang on, is this the same Mat Collins who responded on twitter to a Guardian article about climate catastrophe being in 30 years by saying it could be more like 20? When I was at the Royal Society last October, they were a very nice bunch and throughout the whole meeting there was only one hostile voice raised at one talk. Given time (and money as there is no way I could fund that kind of trip down there more than once), I thought we could have made progress. However, from the sound of it, you haven't had the same kind of welcome. That may be because the conference I was at was inherently "sceptical" because it was about uncertainty in climate models. I'd be very interested whether anyone publicly supported the delusional "95%". And even though I couldn't afford to attend ... it would have been polite for the Royal Society to have invited me back. One last thing, is there any chance of getting an attendance list? I want to put together a short letter explaining that "denier" is not acceptable language and a good list would be helpful. Gobsmacking stuff. The definitions are Orwellian. That table is extraordinary in its frankness. How on Earth do they expect to get away with this? Deus ex machina? So the nightmare scenario is what? That it gets hotter, or that it doesn't? I had hoped that the departure of Beddington might see some credibility return to the role of CSA. It hasn't taken long for Walport to kick that hope into touch. Wow, thanks for bringing this to our attention - difficult to comprehend that the entire skulk* of warmist foxes has been comprehensively machine-gunned by friendly fire. michael hart: "what the manifestations are of a disaster of no floating sea ice in late September?" As far as energy balance, Hudson estimated that the reduced albedo would result in a [globally-averaged] forcing of 0.3 Wm-2 for an "ice-free-summer scenario (no ice for one month, decreased ice at all other times of the year)", which is an increase from the 0.1 Wm-2 which he reckoned for 2007. To put that into context, compare it to the current estimate of greenhouse gas forcing of about 2 Wm-2 (per AR5 WG1 Figure 10.1). So neither negligible nor a disaster. I do like this site. Polite but to the point. A rare combination. "what the manifestations are of a disaster of no floating sea ice in late September?" IIRC Judith Curry has something going about the lack of summer ice in the Kara Sea having implications for Western European winters. Sorry no link at present and too late for this soldier to go looking. Should come up with a search at Climate Etc, she is on record with "watch the Kara"
Perhaps a more scientifically leaning mind would consider the idea that skeptics are gaining traction in communicationg their message because they are able to be more honest in what they say, and have to worry much less how to say it. Splendid report Katabasis, thank you. Oct 3, 2013 at 1:05 AM | Athelstan. Very interesting account, and much appreciated. This new definition of "abrupt climate change" is quite useful. It effectively allows that ordinary non-abrupt warming is really nothing to worry about as it cannot cause "substantial disruptions in human and natural systems". The new defined term seems to mean almost exactly the same as "dangerous" or "catastrophic" anthropogenic global warming (DAGW or CAGW). "Non-abrupters" will now cover the broad church of luke-warmers who accept that human activities cause some long-term contribution to global warming. "Abrupt warmists" will be an alternate for alarmists. It is interesting that many of the usual suspects don't appear to make the list any more. Sea level rise is a problem only if the ice sheets collapse. Masses of heatwave deaths or spread of vector diseases aren't expected. No mention of biblical floods, tornadoes, hurricanes, etc and long droughts won't happen. Where's the problem? Bob Ward as the public relations spearhead of the various speculative Grantham Eco-portfolios has an understandable interest in stirring the media pot and keeping panic and government investments directed towards Grantham Eco-Industries. Joint Met Office Chair in Climate Change Matt Collins' statement "Not my responsibility" leaves me with questions. What responsibilities do highly paid senior public servants have? Introducing premature, expensive technology and raising the price of fossil fuels to match. If this is "Table 12.4 in the draft report" then how is that at all significant? Did it survive in some form into the final report or is it a placeholder for Working Group thoughts? Climate Quislings will simply say it's a draft thing and not at all relevant, won't they? Sir Mark Walport's incredible lack of knowledge can be heard on "Costing the Earth", together with Julia slingo's doom'n'gloom message, and that of many other alarmists. Jack Lacton: you ask why a table in the draft report is at all significant. That was my immediate thought on reading Katabasis's (remarkable and revealing) post. As I understand it, we so far have only the "Final Draft" of the full WG1 report - "accepted but not approved in detail". No doubt this table could be changed, or even deleted, when the final version is published. It may even be a mistake to draw attention to it! According to Mark Walport, chief scientific adviser to the Government, we sceptics (sorry, those who "deny the science") are "single issue, great communicators." No doubt he meant to add that the single issue of importance is that CO2 levels are rising and everything else affecting the climate can be ignored. 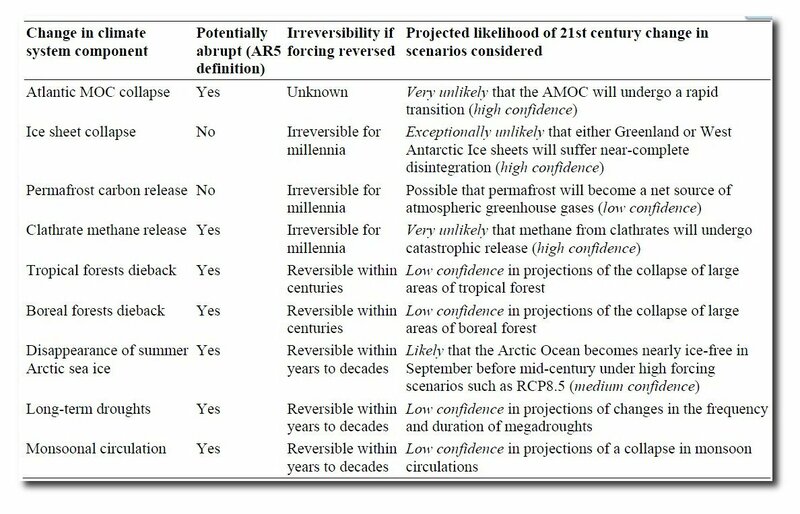 That table needs to be widely circulated, along with a note that the only part of it they consider likely, the artic ice, is complete speculation based on one of their wilder models. I assume as a "high forcing" model it is one of the ones which fails to match reality? "Well, that's the climate summary for the 21st century. Your next bulletin will be in 2114 when we hope to be able to bring you accurate updates on all these projections and more". Interesting word "responsibility" - it means the ability to respond. There must be something amiss if the Joint Met Office Chair in Climate Change at Exeter does not possess the ability to stand up and redress irresponsible inaccurate media headlines on Climate Change. I am quite sure Prof Slingo would make the Met Office's substantial PR and Media operation available. Further to Jack Lacton's and my comments above (about this being a draft report), I recall how excited many people got about Figure 1.4 in the Second Order Draft of the SPM (showing post-AR4 temperature observations falling outside the envelope of earlier IPCC projections). But the Approved Version of Figure 1.4 had the observations inside the envelope. Be careful: the same thing might happen to Table 12.4. I'd like to add a few contributions. On the science - it's worth also mentioning the start of Mat's talk, where he said one could argue the projected global mean temperature changes themselves could be described as "abrupt" under that definition. I *thought* Bob Ward said "several sceptics have registered" and don't remember him saying "managed to get a ticket" - perhaps he said both - but it didn't come across with a negative tone to me (and I am usually fairly sensitive to these things...). My understanding of "datum" is that it means "piece of information" (e.g. http://www.thefreedictionary.com/datum) rather than "measurement", so I personally think it's OK to use for the output of models. I (and at least one other scientist at the meeting) did think it was a shame Mat didn't simply say - "yes, we should address any kind of misrepresentation of the science" - because I'm sure he thinks that. I *think* his feeling, and the reasons he didn't answer the question, was that we had already talked a lot about communication during the meeting, and he wanted to focus on the science (his area of expertise) rather than communication (not his area of expertise). I might point out that Mat does spend quite a lot of time making himself available for questions from the public - mostly, I think, via Twitter, public talks, and public meetings such as the RMetS uncertainty one he organised that various Bishop Hillers came to. I should point out that it is quite a large meeting and not everyone is getting a chance to ask questions. Benny from GWPF has had more than one question answered, I think, and Piers Corbyn too. These are well-known sceptic faces! so it's not as if there's any silencing going on. If we are getting to a point where we agree IPCC reports are not "alarmist" (or even just this one - it's the most relevant because current science/scientists) but that climate science is often misreported by the media, then that's great - and I would love to try and help with this (and do try, already). "No doubt this table could be changed, or even deleted, when the final version is published. It may even be a mistake to draw attention to it!" I think we saw the demise of fig 1.4 from the SOD as a result of the interest it caused amongst sceptics. I also vote that we ignore table 12.4 for now, which may well increase its chances of making the final report. Then we have our fun. "Be careful: the same thing might happen to Table 12.4." Every chance, but then the changes have to be explained leading inevitably to high profile public "discussions/debates" and the more the better. The media are going to spin it anyhow, but with changes having to be justified there is a better chance of some of the actual facts sticking. I also suspect the "discussions/debates" taking place with regard to Figure 1.4 are far from over. I agree that if the scientists are privately cautious then that's a step forward. It would interesting if this could be explained to the media by some of those involved. We still have leading scientists like Julia Slingo hyping things up. There is a comment in the report attributed to Julia Slingo that suggests she is of the opinion that due to the PDO there could possibly be no further warming for about 30 years. Is that your take on what was said? Disappearance of Summer sea ice: Nearly ice-free! Imagine the climate magician with a rabbit's tail popping from under his top hat. Ta da! We - or most of us - have always been privately cautious ;) We've always put caveats in our papers and conference talks. The difference now is that climate science & scientists are becoming more public and open, through these public meetings, Twitter, public events, open access journals (see for example The Cryosphere, Climate of the Past). In other words, it is now much clearer to see if our work is being misrepresented by others. We saw an example of this with the Times Atlas, where glaciologists swiftly highlighted the Greenland error. We are getting better at being proactive and loud on this (but could do more). Julia pointed out that the PDO has a timescale of about 30 years. The implication I took from that was that the *variability* part of the pause (currently thought to explain about half of the pause, the other half being cooling effects from a weaker sun and more volcanoes) could be up to about 30 years in total, i.e. 15 more years. Though I think she said timescale of the PDO - i.e. the increased ocean heat uptake itself would be a bit shorter, if it's not an instantaneous switch. But not everyone agrees the PDO is responsible, or completely responsibile, for the variability part of the pause. And of course we have to consider the effects of the driving factors, as well as the variability - we will be coming out of the solar minimum (i.e. more warming expected), and the relative balance of greenhouse gases and aerosols (rate of warming will depend on our emissions of both, and eruptions of volcanoes). With regard to "out of the woods", I think she either meant emerging from the current state (rather than emerging from something bad to good), or emerging from the difficulties of communicating the relatively low relevance of a shortish period to the existence of AGW (or model success). My memory was that she quickly qualified her statement with one or both of those statements, but I may have misheard or be confusing it with another question about the pause later in the day. I thought one of the interesting plots of the day was a "rank histogram", which are used in testing weather forecasting ensembles, of how well the models have matched 15 year trends in the past, using all possible trends (i.e. starting in any year). It was flattish, which indicates the models have been about as often *colder* than the observations as warmer. There's also a plot in the IPCC report showing that if you look at the past 60 year trend, the models are pretty bang on.
" if you look at the past 60 year trend, the models are pretty bang on." Of course they are tuned to match the part of the observations which lie in the past, it would be pointless if they did not. But that does not lead to a conclusion that the future bit is right. It seems that 98% of them run warm. A neutral lay observer might wonder why you don't chuck out the ones which run warmest as being no good. A neutral lay observer of a cynical bent might think some of the models are included because it might offend the nations of origin to chuck them out. Anyhow, if they all use 'the same physics' and they all run hot then please consider the possibility that there is some assumption in that physics which is incorrect. From what you say it does appear that Prof Slingo is of the opinion that a protracted hiatus of another 15 years or even 30 years is not out of the question. This is interesting as the 30 year rate of warming chart shows a distinct 60 year peak to peak cycle, last peak was early 2003 thus suggesting that the rate of warming will continue to reduce for approx a further 20 years. The debate about the causes of any such hiatus will continue unabated. Thanks again, going to be interesting watching how the next decade plays out. What about the fact that we don't expect individual simulations to predict the timing of different phases of natural variability (only their statistical properties)? Why is that not relevant to you? We didn't successfully predict something (i.e. relatively short-term trend) that we didn't try to predict...this is not evidence that the models are inadequate.... I can see we must not have been clear enough about this - or made sure the media understood it - in the past. But given all the discussions about it now, I can't see why people don't agree it would at least partially explains the mismatch? Genuine question - trying to understand people's POV. For example, is it a hindcast vs forecast question? i.e. a question about tuning to past data? Tamsin - anyone who has read Ward's frothing at the mouth Twatters can't take the guy seriously. He's an extreme propagandist, with all that that brings with it. And rude to boot, a problem that seems to afflict rather a lot of climate scientists (if one can call the likes of Mann such) and their acolytes. We sceptics are far better behaved it would seem to me. “If you torture the data enough, nature will always confess” – Ronald Coase.